No one sins out of duty. We sin because it offers some promise of happiness. That promise enslaves us–until we believe that God is more desirable than life itself (Psalm 63:3). Only the power of God’s superior promises in the gospel can emancipate our hearts from servitude to the shallow promises and fleeting pleasures of sin. Pastor John Piper shows how to sever the clinging roots of sin that ensnare us, including anxiety, pride, shame, impatience, covetousness, bitterness, despondency, and lust. Delighting in the bounty of God’s glorious gospel promises will free us for a less sin-encumbered life, to the glory of Christ. 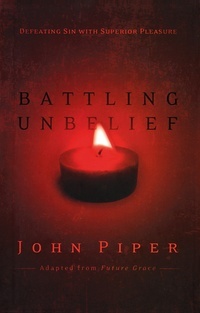 Rooted in solid biblical reflection, this book aims to help guide you through the battles to the joys of victory by the power of the gospel and its superior pleasure.